Odds are a comparison between one team (or player) and the other, based on their previous games, current performance, possible injuries and what outcome the bookmakers expects. Lower odds indicate who is more likely to win the game or what is more likely to happen. Let's take a look at the following basketball game - Los Angeles Clippers vs. Cleveland Cavaliers - moneyline and place a 10€ bet on our favorite team. As you can see, you'll make more money if LA Clippers win the game. The bookmaker has before the game started, decided to make Cleveland a favorite. Their current form is better, their key players aren't injured, they are simply more likely to win. This is why their odds are lower and that's how betting odds work. This should be the basics of betting. For instance, let's take a look at a soccer match. We all expect to see at least one goal in a 90 minute game and so does the bookmaker. That's why the odds for the option "How many goals will be scored" are usually very low (1.01 - 1.10). No bookmaker will pay you a lot of money for an almost sure thing. There is a very simple and effective way to transfer the money from and to your bookmakers account. Skrill is a solution to all your online money transfers. Skrill is an online wallet. You can send and receive money, store cards, link bank accounts and pay conveniently anytime and anywhere using only your email address and password. Transfer funds – including betting winnings – from Skrill to your bank account or make ATM withdrawals with a Skrill Prepaid MasterCard®. First - let's visit Skrill.com website. The page opens in a new windows so it doesn't disturb your visit at Betspot.net. Let's open a free account by pressing the large button in the middle of the screen and follow the on-screen tutorial. Register in minutes and play or pay in seconds. It is not necessary to use Skrill or any other online wallet to be able to make money betting. You can use your credit or pre-paid card, online banking or Paysafe card. But there are benefits of using Skrill and here are some facts. Security. You don't need to share your credit card number all over the Internet. No matter what you do, play, bet, do shopping, it's enough to share it with Skrill only and upload your money to it. Speed. When betting, fast transactions are important. Deposits from Skrill to a bookmaker are instant and withdrawals to Skrill are usually the fastest. No credit card necessary. Even if you don't own a credit or pre-paid card, you can still use Skrill. Instead of a credit card, buy a Paysafe card in your local shop and enter the code to Skrill. Bank transfer is another option but not recommended as it takes 3 to 5 days for money to arrive. Pre-paid Mastercard. Once you use Skrill, you can get your own Mastercard which can be used for shopping and spending like a regular pre-paid card only this one is funded through Skrill. Imagine - you just made 200€ on football and would like to take your girl out on a dinner. 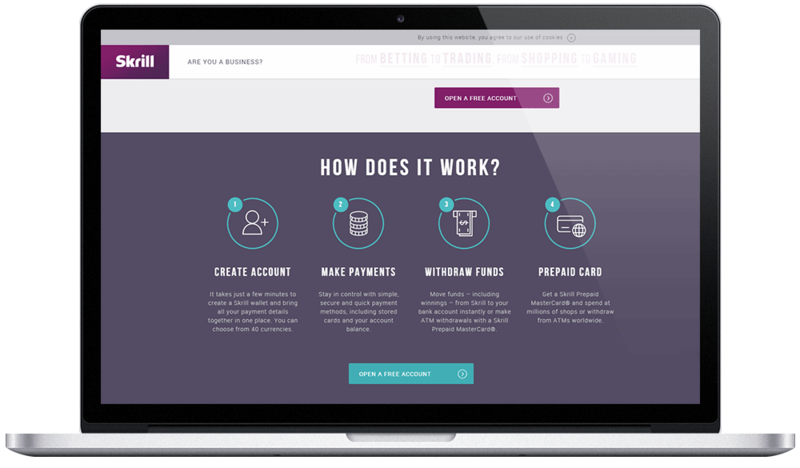 Ask for a withdrawal to Skrill and once the money is there, you are able to spend those winnings immediately. Go out and pay in the Restaurant with your Mastercard. If you prefer cash in your hands use your card on your ATM machine and withdraw the winnings (up to 250€ daily). Very low costs. The Skrill service is not free, but it's affordable and well worth it. When uploading funds with credit card, the fee is 1.9% of the uploaded amount (100€ upload costs you 1.9€). Withdrawals are charged with 2.95€ and there is a 10 EUR annual fee for your Mastercard. Now you know how betting odds work, how to transfer funds, it's time for the real thing. There are hundreds different bookmakers and the decision where to play should not be taken lightly. Some bookmakers are experts for European sports, some are based on US sports, some will take small bets and will limit you as soon you start winning. We have tested the majority of bookmakers and experienced their strengths and weaknesses. All the ups and downs left us with a handful of bookmakers where we experienced no problems at all. And those are the only ones on our recommended list. 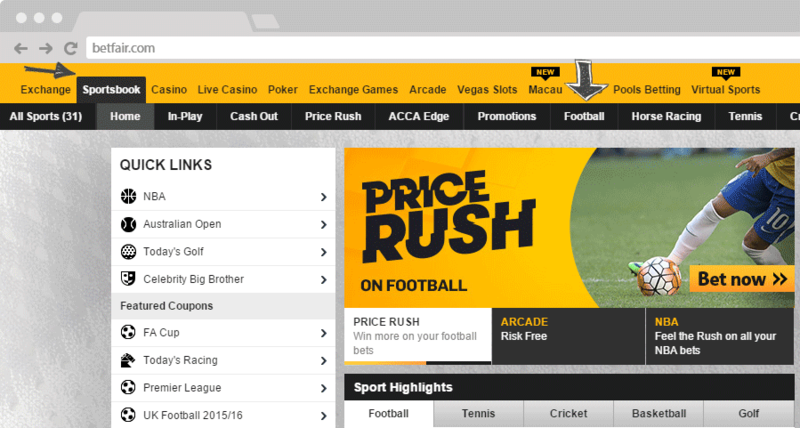 Let's visit Betfair and Sign up as a new player. 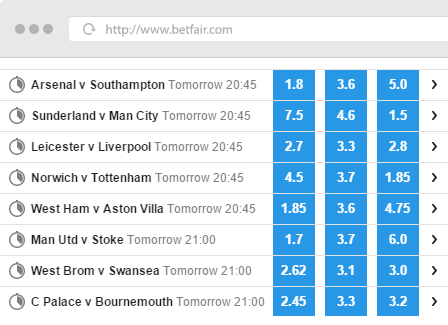 Betfair also comes with a small welcome present for new players. Make sure you enter your real information! Your identity needs to be confirmed before you withdraw your winnings for the first time. You'll need a scanned copy of a personal id and a copy of a utility bill that confirms your address. Don't get upset by the amount of security checks, this is for your own protection! You simply need to be you, not your minor son who didn't turn 18 yet. The registration procedure is fast and takes only minutes. Now you can log in as a real player. Once logged in, click on DEPOSIT and choose Skrill, Credit/Debit card, Paysafe card or bank transfer. Simply follow the instructions on screen. When finished, click on "SPORTSBOOK" and let's take a look. 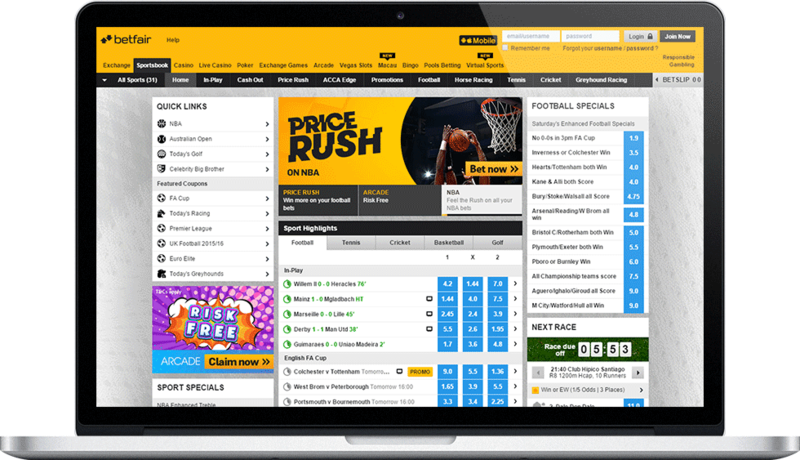 Betfair's sportsbook offers betting on the most popular sports like football (soccer), basketball, tennis, golf, cricket, horse and greyhound racing. In this example, we'll place a simple bet on football. Clicking on "sportsbook" and "football" (see arrows on screenshot) will take you to the football section. A list of available leagues, current and upcoming games shows up. Find a game or a team you like and try to predict a winner of the match. There are three possible outcomes, and there are three different odds next to the game. Team on the left plays at home, while team on the right are their guests. Those odds are often referred to as "1 - X - 2". Take a look at the first game - Arsenal vs. Southampton. 1.8 are odds for Arsenal, 5.0 for Southampton and X (draw) is available at 3.6. Let's place 10€ on Arsenal. Click on the blue square with odds 1.8 and the game is added to our betting slip. The betting slip is visible in the top right side of the page. Enter your stake and click on "Place bets". That's it. Your bet is placed. Sit back, relax, enjoy the game and let's hope for your favorite to win. The list of your placed bets is accessible via the menu My account > my bets. Once the game is finished the winnings are transferred within minutes to your betting account. You have just learned how to place a simple bet. If you like to keep it simple and have occasional fun, that's enough. If you're serious about making money betting from the comfort of your home, there are still things to be learned. Our website is full of information for beginners and advanced players. Simply follow the menu on top and take a look at our betting strategies and football predictions. 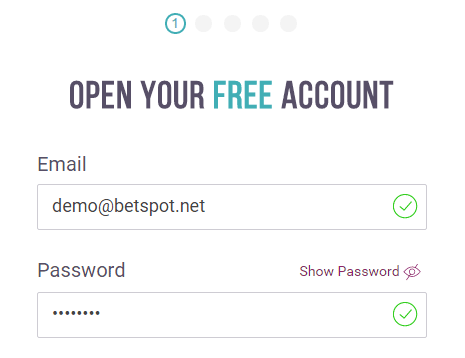 Welcome to the world of betting with Betspot.net.